Starting off my smoking day with the last of my stash of vintage Edgeworth Slices in an old medium bend grain etched Preben Holm Ben Wade Prominence B freehand with a black vulcanite stem. Ice tea and bergs is my drink on another very hot and humid day. My after lunch smoke is C&D Bailey’s Front Porch in a 1970s slight bend black sandblasted English Rustic 120 Billiard with a black vulcanite stem. Watching the Cubs - D-Backs game. Dunbar in a 2003 medium bent straight grain Two dot 2 P. Ardor Venere Extra Bucaneve with a silver ferrule signed by Dorelio Rovera. ET Dunbar, out of a well-stained wrapper (yummers!) in the Paul's Red Algerian briar Cayuga, oil-cured. 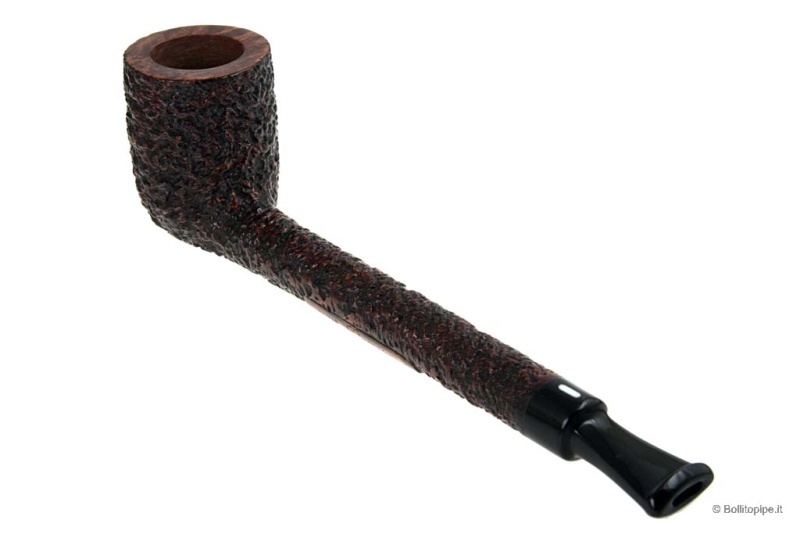 Edward G. Robinson's Pipe Blend in a 1980s black sandblasted slight bend Savory’s Argyll 281 Cherrywood with a black vulcanite stem. GLP Maltese Falcon in the Mastro de Paja 3A Sun billiard. Peter Heinrichs Curly Block in a straight black sandblasted 1968 Dunhill Shell bulldog with a black vulcanite stem. Have enough for a few more bowls. House of Calabash 28 yr 9 Vas w/Par in a current production Kirsten VX. I saved this pipe for a first smoke with a special tobacco. I visited Steven Books shop on my trip this May up hwy 5. After visiting with him an a visitor Alex, Steven brought out a vessel crammed to the top with a fermented with plums note. In spite of the heat here, 95 F. I had to try it. Smoked with 2 relights to last 10% of bowl. Then many relights but so good. 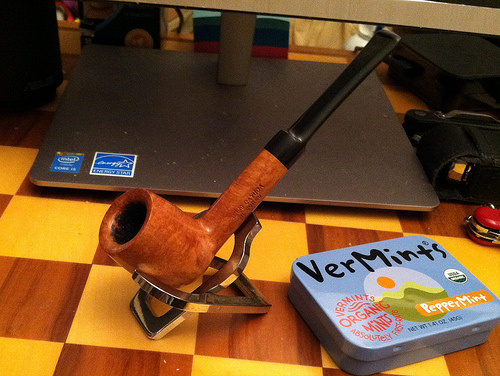 Just finished smoking FVF in a 2002 caramel colored medium bend paneled sandbasted Rinaldo Egea Megas 04. The bowl is as big as my fist, so I got almost a three hour smoke in as I finished reading a biography of Paul Frees I've meant to finish for a while now. 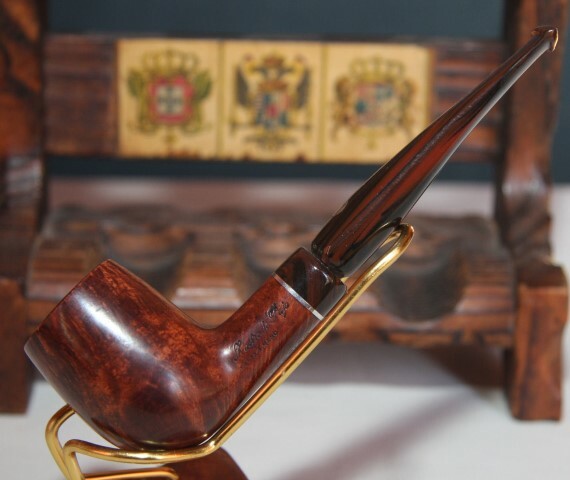 SHPC Great Hiatus in a 1990s smooth Peterson Captain Pete XL80 bulldog with a black vulcanite p-lip stem. The last of this sample of Peretti’s No. 101 in a 2003 IMP horn Meer with a black acrylic stem. Poul Winslow No 1 - Stanwell Amber 13. Sir Walter Raleigh in a 2015 Basil Meadows Bing Crosby Merchant Service replica with a smooth straight thin shank, aluminum band and black ebonite stem. Luxury Navy Flake in a Stanwell Nordic sandblasted billiard. Orlik Racing Green in a 1979 medium bend etch relief meerschaum lined TinderBox Arabesque with a black vulcanite stem. 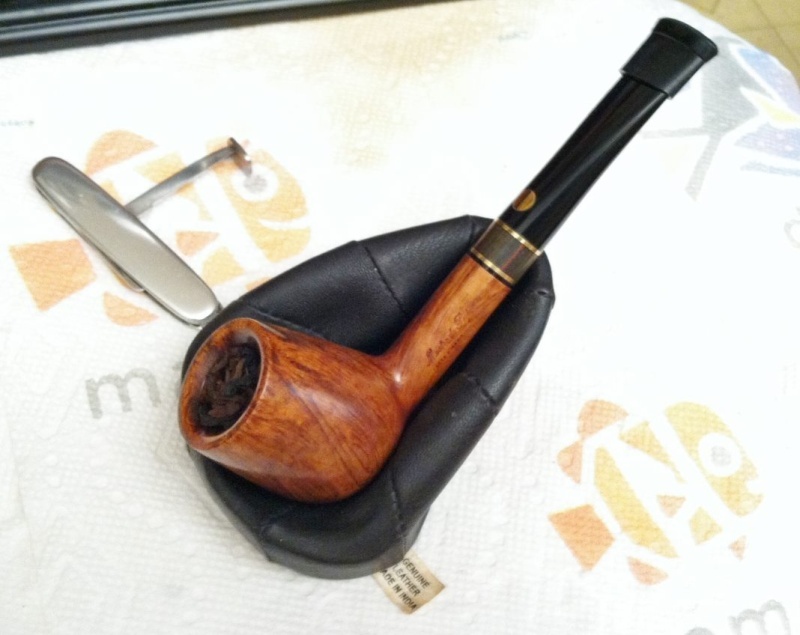 MacBaren Vintage Syrian in a Mastro De Paja Billiard with a Cumberland stem.